Shaun Dubis is a recovering heroin addict and a former dealer with a modest rap sheet. Just over two years ago, the 35-year-old was arrested as part of a joint investigation involving the DEA, ATF, FBI and North Charleston Police Department after he was caught on a wiretap negotiating the purchase of heroin to distribute in nearby Mount Pleasant, South Carolina. The original federal charges against Dubis exposed him to a 10-year mandatory minimum sentence and, potentially, life in prison. Yet he's not an inmate in the massive federal prison system. These days his parole officer says he's on the right path. He's working at his brother's company and attending Narcotics Anonymous meetings every other day. "You can really see a change in him, a physical change in him. The way he looks, the way he talks," said attorney James Kevin Holmes, who is representing Dubis on a pro bono basis. "He's progressing real well." Every other week, Dubis reports to the federal courthouse in downtown Charleston, South Carolina, just a few miles south of the subsidized apartment complex that the gang tied to his heroin supplier controlled. On this particular Friday in April, Dubis is waiting in the jury box with over a dozen other participants in what's called the BRIDGE Program, more commonly known as a drug court. It's a cooperative effort by South Carolina's federal judges, public defenders, probation officers and prosecutors, launched in 2010 to help federal defendants deal with substance abuse issues and to potentially pursue alternatives to incarceration. The program participants stand up, one by one, before U.S. Magistrate Judge Bruce Howe Hendricks, an energetic Charleston native who previously worked as a federal prosecutor. She asks them how they've been doing, quizzing them about their work schedules, their efforts to overcome their addictions, even their exercise regimens. When it's Dubis' turn, Hendricks asks him about his new health insurance plan. It's been less than two weeks since the deadline to enroll under the Affordable Care Act, and Hendricks presses Dubis about his experience with the glitch-prone sign-up process. "I obtained health care," Dubis deadpans. There are some laughs, and all eyes in the audience shoot across the courtroom toward the man with the FBI entourage. Eric Holder, the 82nd attorney general of the United States, motions for the former heroin dealer to continue. Holder didn't come to Charleston to highlight an Obamacare success story. The visit is one stop on a tour that over the past several months has taken the nation's top law enforcement official to cities around the country where some of his 93 U.S. attorneys are experimenting with alternatives to locking people up as long as possible, like the BRIDGE Program. The rules of the South Carolina program are strict. In addition to attending regular substance abuse meetings, undergoing drug testing and refraining from the use of even legal drugs like alcohol, participants must allow federal probation officers access to all their financial, medical and education records. Their social media accounts -- Facebook, Twitter, Instagram, everything -- are monitored as well. But the payoff can be substantial. For participants like Dubis who have pleaded guilty but not yet been sentenced, successful completion of the program can lead the prosecutor in their case to ask the judge to hand down a lesser sentence, reduce the charges or even dismiss them altogether. "It changed my life. It's incredible," said Torey Lunsk, 26, a recent graduate of the program. The Philadelphia native had been facing years behind bars on federal drug charges: He was driving to Florida to buy prescription painkillers when he was pulled over on Interstate 95 in South Carolina. While on bail, he tested positive for opiate use. But today, instead of prison, he is free and working steadily. "This program gave me responsibility and accountability, two things I really didn't have before," Lunsk said. "This was the only thing I've ever finished in my life besides high school. Everything else I really quit. I quit football, I quit college. This was the only thing I ever really finished. I needed it." U.S. Attorney Bill Nettles, a former public defender who has been South Carolina's top federal prosecutor since 2010, explained how his office rethinks sentencing for those who make it through the program. "There's a meaningful discussion about what we view to be an appropriate sentence in light of the fact that we're now sentencing a different person than we arrested," said Nettles. "The person we would have sentenced before the program isn't the same person we would have sentenced after the program." This emphasis on reform and rehabilitation rather than simply incarceration -- the Justice Department's traditional approach to the drug war -- is what's animating Holder now. For decades, Holder has witnessed the negative effects of America's criminal justice system, particularly on the lives of young black men. As a young man himself, he saw childhood friends go down the wrong path and wind up incarcerated. As a judge in Washington, D.C., he saw lives destroyed by drug charges. As the No. 2 official at the Department of Justice in the late 1990s, he saw more and more of DOJ's budget eaten up by the cost of the booming federal prison system. Now, Holder finally sees his chance to fix it. Eight years ago, it would have been unimaginable for the U.S. attorney general to visit a federal drug court -- first and foremost because such programs were virtually nonexistent. While the Justice Department has long been supportive of state drug courts, which deal mostly with low-level offenders, the department told Congress in 2006 that federal drug courts weren't necessary because just a "small and uncertain number of offenders" would qualify. Federal defendants, DOJ said at the time, would receive plenty of help with their drug and alcohol addictions from the Federal Bureau of Prisons, once they were behind bars. But that was yesterday's assessment. Today, even apart from the question of whether locking up drug offenders for many years is the best policy, the financial realities of the drug war are having a major impact on the Justice Department. The department's inspector general has warned that federal prison overcrowding presents an "increasingly critical threat" to DOJ's ability to fulfill its mission. Bureau of Prisons costs make up one-third of the department's overall budget. Half of federal inmates are behind bars on drug charges, many of them low- or mid-level offenders locked up for decades as a result of mandatory minimum sentencing laws. 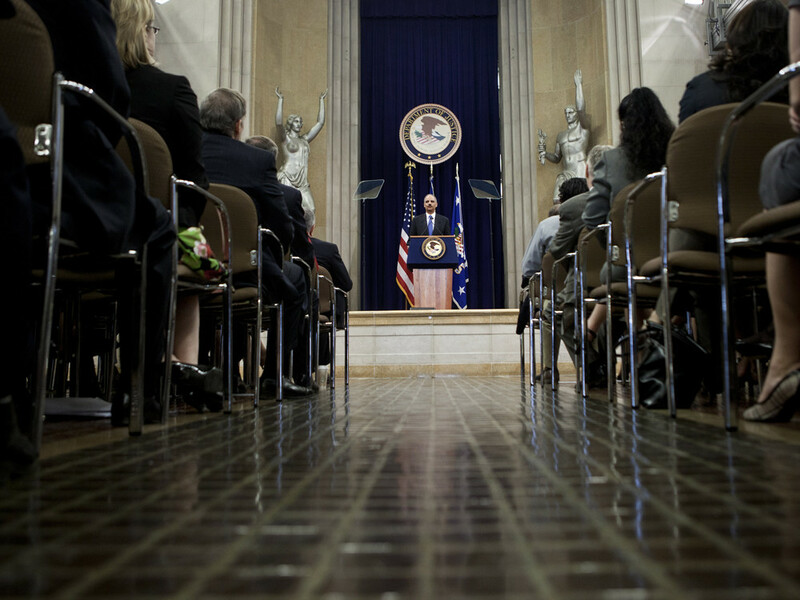 Holder called for "sweeping, systemic changes" to the "broken" federal justice system in a speech last August. One of the first big moves in his Smart on Crime initiative was to implement a new policy that allows prosecutors to work around mandatory minimums for certain non-violent drug offenders, which Holder called "draconian." Such cases, he suggested, might not belong in federal court at all. According to DOJ, the overall goal of Smart on Crime is to enforce federal laws more fairly and efficiently, recognizing that the criminal justice system "may actually exacerbate … rather than alleviate" the "vicious cycle of poverty, criminality and incarceration" that traps many Americans. 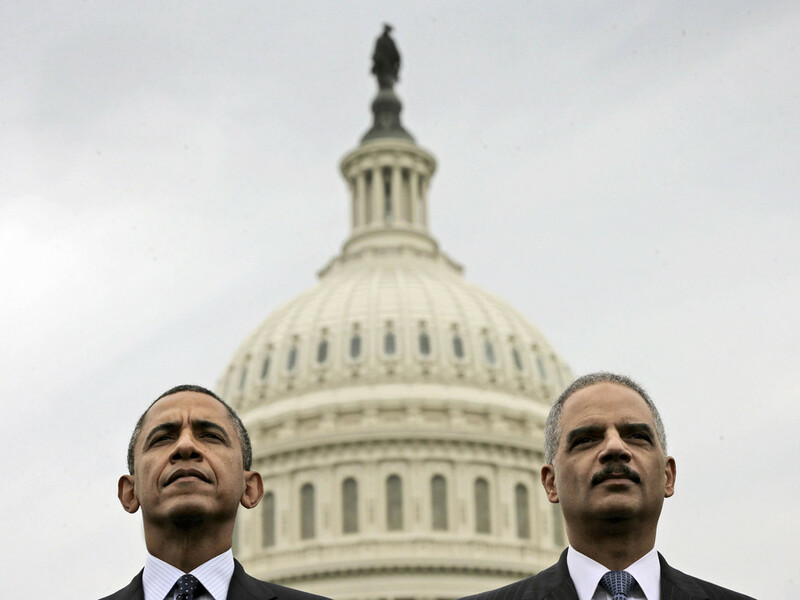 Holder recently endorsed changes by the U.S. Sentencing Commission that would lower the ranges for federal drug sentences and told prosecutors not to object if defendants ask to be sentenced under those pending guidelines. The Justice Department has imposed more requirements on halfway houses, mandating that they provide mental and substance abuse treatment, allow for cell phone access and offer transportation so inmates can find jobs. And last month, the department announced plans to collect data on police stops, searches and arrests in order to examine racial bias in the criminal justice system. Holder has also highlighted innovative local programs that aim to clean up high-crime neighborhoods without resorting to mass arrests and others that help felons transition back into society after serving their time behind bars. For Holder, the new approach is the culmination of his experience as a prosecutor, judge and criminal defense attorney. In 1991, he told a Washington Post reporter, who was shadowing the then-D.C. Superior Court judge, that he was struck by just how many "young black guys, 18 to 25," were appearing before him. The experience has clearly stuck with Holder. "Well, I'll tell you, as a former judge, I had to put in jail substantial numbers of young people for possessory drug offenses, and it was not from the perspective I had as a judge necessarily a good use of law enforcement resources," he told HuffPost after visiting the drug court in Charleston. "When I became U.S. attorney, we put in place certain guidelines so that people would not end up, especially young people, with criminal records and all that then implies for them." Holder's approach as U.S. attorney for the District of Columbia was in some ways like the drug court in Charleston: permitting defendants to plead guilty to misdemeanors and allowing those convictions to be vacated if the defendants behaved and met certain conditions. Reversing his predecessors, Holder directed assistant U.S. attorneys -- who in D.C. handle both local and federal cases -- to move lower-level drug offenses to the local trial court, where defendants could avoid the mandatory minimums that federal judges would be forced to impose. "He has cared deeply about criminal justice issues, going back to when he was U.S. attorney, which is when I first got to know him," said defense attorney Amy Jeffress, a former top aide at the Justice Department, recalling her initial work with Holder in the mid-1990s. "I think he's shown a consistent dedication to these issues." "He's at a singular place professionally where he's got three decades of experience, much of which involves the intersection of race and the criminal justice system," said lobbyist Robert Raben, a longtime Holder friend and former Justice Department official. "He's not just turning the wheels and trying to avoid mistakes. He's going big and going bold," said U.S. Attorney Tim Heaphy, who joined the department in 1994 and now serves as the top federal prosecutor in the Western District of Virginia. "He is taking advantage of a moment here and trying to leave the department and the system in a better, more effective place than when he got here." Before he started rolling out criminal justice reforms, Holder's tenure had been defined mostly by crises, scandals and criticism. He inherited a Justice Department still reeling from the Bush administration's politicized hiring of career lawyers and its firing of several U.S. attorneys for partisan and improper reasons. He spent much of his early years on the job dealing with major national security issues: new policies on interrogation and detention, terrorist attacks, and the failed effort to close the Guantanamo prison camp and move the trial of alleged 9/11 mastermind Khalid Sheikh Mohammed to federal court in New York. "The attorney general could have given a press conference in 2010 announcing the most dramatic reforms in history to sentencing, and the first question from the press would have been, 'Have you made a decision yet on the KSM trial?'" said communications consultant Matt Miller, Holder's former spokesman. The lowest point of his tenure came in 2012, when House Republicans voted to hold the attorney general in contempt of Congress for refusing to turn over some documents related to the Operation Fast and Furious gun-running scandal. It marked the first time in American history that Congress had taken such action against a sitting Cabinet official. That's not what Holder wants to be known for. Nor does he wish to be remembered as the attorney general who oversaw the aggressive pursuit of whistleblowers or who failed to put any big Wall Street bankers behind bars. Criminal justice reform has the potential to be his major accomplishment at DOJ -- bigger even than his decision not to defend the Defense of Marriage Act and his aggressive pursuit of civil and voting rights cases. It's an endeavor for which he has found widespread support. Since 2000, 29 states have rolled back mandatory minimum sentences, mostly focusing on lowering penalties for nonviolent drug offenses. Fiscal concerns and religious beliefs about second chances have led congressional Republicans to support reforms as well. On the left, where Holder's DOJ has faced criticism on a plethora of national security and transparency issues, criminal justice is one area where he receives high marks. "I think it's historic. It's a bold move by the attorney general," said Jesselyn McCurdy, senior legislative counsel for the American Civil Liberties Union's Washington Legislative Office. "I give him credit for what he can do in his authority to address what he has seen as a problem that affects the entire Justice Department budget, in terms of who we're holding in prison. I give him a very good grade on how they have rethought the way they prosecute crime, the way they charge crime and who they put in prison for crime." Holder has also endorsed the proposed Smarter Sentencing Act, a bipartisan bill backed by Republican Sens. Mike Lee of Utah, Ted Cruz of Texas and Jeff Flake of Arizona that would lower the length of mandatory minimums. It cleared the Senate Judiciary Committee in January. But Holder's reforms have sparked concerns within the law enforcement community, even among the federal prosecutors he oversees. The National Association of Assistant United States Attorneys argued in a recent letter to Holder that mandatory minimums are effective, since they reach "only to the most serious of crimes" and "target the most serious criminals." A number of former Justice Department and Drug Enforcement Administration officials "who served in the war on drugs" also wrote a letter suggesting that reducing mandatory minimums would be a threat to public safety. Several major law enforcement organizations are quietly lobbying against the bill. Michele Leonhart, head of the DEA, even defended mandatory minimums at a congressional hearing last month, calling them "very important to our investigations." In the federal system, the threat of mandatory minimums is commonly used both to push defendants to become informants and to convince them to plead guilty without going to trial. A staggering 97 percent of federal defendants cop a plea rather than go to trial on additional charges that would expose them to even longer mandatory minimum sentences. Holder's theory, however, is that the amount of time they might spend behind bars isn't the key motivation for low-level defendants who inform on their higher-ups. "I don't think it's necessarily the length of sentence that induces cooperation as much as the certainty of punishment that induces the needed cooperation," Holder told HuffPost. "I've been a prosecutor since 1976, I understand the notion of starting at the bottom and working your way up, and I would never put in place a system that would undercut that fundamental part of our law enforcement system." "And yet I think we can be smarter," he said. "We don't have to put people in jail for 10 and 15 years. You could have sentences that are substantially shorter that will, necessarily, continue to induce the kind of cooperation that we need." Holder said he understands why his fellow law enforcement officials are worried. "What we're talking about are fundamental kinds of change, and people aren't necessarily always comfortable, at least initially, with change," he told HuffPost. According to Miller, the decision to delay rolling out the reforms until now was partly a deliberate strategy not to shock the system and instead to implement reforms gradually so prosecutors can see that the "sky hasn't fallen." While Holder has been encouraging about federal drug courts, for example, he hasn't forced all the semi-autonomous U.S. attorneys to implement them. He believes the programs should be tailored to the "specific needs of the community," he said at a press conference following the drug court proceedings in Charleston, rather than imposed by officials in Washington. So far, only a handful of federal drug courts exist -- in California, Connecticut, Illinois, New Hampshire, New York, South Carolina, Virginia and Washington state. They began proliferating in 2010 and 2011 after DOJ did away with a policy that stopped those addicted to drugs from entering pretrial diversion programs. At the press conference, Holder held up the South Carolina version as a model he wants to "try to emulate" around the country. "This is what this administration is trying to do, new things, evidence-based things," Holder said after watching the drug court in action. "It doesn't mean that everything we try will be successful, but we're willing to take some chances." Holder's trip to Charleston highlighted a flaw in the defense of mandatory minimums: The notion that low-level offenders don't get caught up in the federal system isn't always true. Participants in the BRIDGE Program are far from drug kingpins. Most, if not all, of them don't have the financial resources to afford their own lawyers and are represented by federal public defenders or court-appointed counselors. Not all the participants that day in April had even been charged in drug cases. One was recruited by a pawn shop owner to steal a Dyson vacuum cleaner from a Lowe's store and was charged in a federal conspiracy case. Another was facing federal charges because he tried to pay a liquor store with a counterfeit $20 bill his friends had made using a printer-scanner-copier. J. Robert Haley, a federal public defender with a number of clients before the drug court, said he had watched with dismay since the early 1980s as the federal criminal justice system "became intent on incarcerating everyone for as long as it could." The BRIDGE Program, he said, is a positive shift away from that mentality. "I have seen people go into that program who were just raging drug addicts who were facing significant prison sentences. I have watched them complete that program and not go to jail," said Haley, noting that saves taxpayers thousands of dollars a year. "I cannot say enough good things about the program." Despite the criticism from some corners of the law enforcement community, Holder's initiatives also have the support of a number of federal prosecutors. "When I first started as a federal prosecutor, I had very little discretion," said Heaphy, the U.S. attorney in western Virginia. "I had to charge and insist on a plea to the most serious readily provable [charge]. That was a reflection of having a kind of distrust in my individual discretion in any particular case." Holder did away with that policy in 2010, instructing prosecutors to rely on an "individualized assessment" of the defendant's conduct and criminal history, its impact on the victims, the needs of the community, and federal resources and priorities. In 2013, he required each U.S. attorney to develop guidelines specific to his or her district that laid out when cases should and should not be pursued. "What the attorney general is now saying is, 'I want you all out in the field, not Washington ... to make good decisions that are tailored to that person and that outcome.' That is shifting discretion to the field," Heaphy said. The reforms Holder has put in place so far are not the end of his Smart on Crime push. When the attorney general sat down with HuffPost in mid-April, one of the major lingering concerns for criminal justice reform advocates was the seemingly broken process for commuting sentences and the troubled leadership of the Justice Department's Office of the Pardon Attorney, which makes clemency recommendations to the president. The administration's record on pardons has been meager, with President Barack Obama granting clemency less frequently than any other president in modern history. Holder told HuffPost there needed to be "changes in the pardon attorney's office," and a little over a week later, U.S. 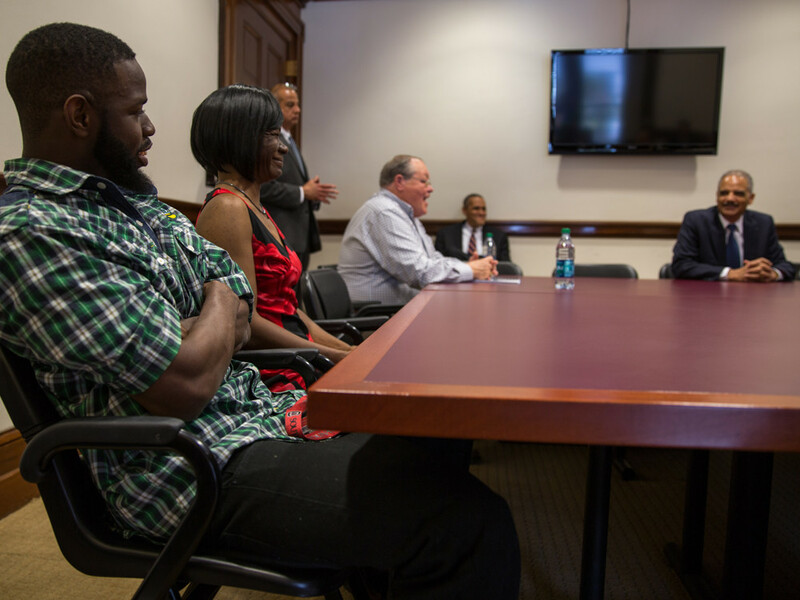 Pardon Attorney Ronald L. Rodgers resigned and DOJ announced a large expansion of clemency eligibility. Justice Department officials are now preparing for thousands of clemency applications, and hundreds of offenders sentenced to decades in prison could get their lives back. When asked what's next for Smart on Crime, Holder also mentioned the pending revisions to the department's racial profiling rules and how they apply in the national security context. The New York Times recently reported that Holder's draft rules will allow the continued use of many controversial FBI tactics, like mapping ethnic populations. The paper described the rules as a "compromise between his desire to protect the rights of minorities and the concern of career national security officials that they would be hindered in their efforts to combat terrorism." The attorney general told HuffPost that the Justice Department would have an announcement about the racial profiling rules "fairly shortly" and that he was "happy with the process," although he added that the revisions took "a little too long" -- nearly five years. "But I'm happy with where we are. I hope people will see the changes. I hope they'll receive them well," he said. Because the department policies Holder has carefully put in place could be rewritten by the next administration, he wants to ensure that the federal sentencing changes are codified into law. "We've done a lot on the executive side with all the powers and ability we have. But now I think we've got to work with members of Congress," Holder said, referring to the Smarter Sentencing Act. "So I think that is the next place we need to be focusing our attention." 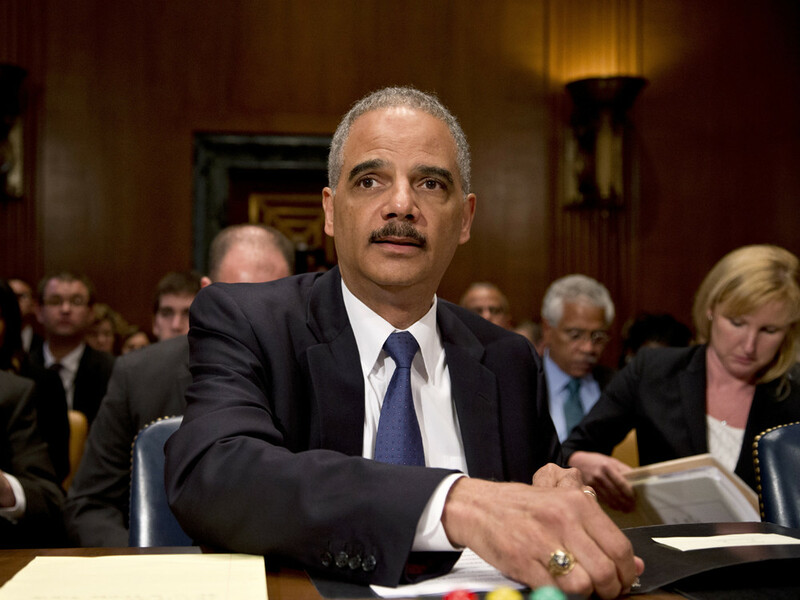 In late April, Holder became the fourth longest serving attorney general in U.S. history. While the Justice Department has confirmed that he plans to remain in office at least through the midterm elections this fall, his precise plans beyond November are a mystery, apparently even to Holder himself. "I haven't really set anything in my own mind in terms of the time frame," Holder said, when asked whether he might remain in office until the end of the Obama administration. His recent purchase of a condo in downtown Washington doesn't offer much of a hint. "You'll have to figure that one out. It's closer to the Justice Department, but also closer to Covington & Burling," Holder said, referring to the law firm for which he once worked and to which he's widely expected to return after he steps down as attorney general. "In terms of my own thinking of how long do I stay -- my wife asks me this way more than you do -- I talk about tasks and trying to see certain things through," Holder said. "I want to try to get a few things done before I ultimately leave."